The hosts lost the ODI series 1-2 but were delighted with the win on Sunday. Chamari Atapattu scored a match-winning century on Sunday in Katunayake to ensure that Sri Lanka ended the three-match One-Day International series against India on a high. Chasing 254 to win and avoid a 3-0 whitewash, captain Atapattu (115 off 133 balls) shared a 101-run opening partnership with Hasini Perera (45 off 70 balls) to get the Lankans off to a good start. Sri Lanka’s scoring rate, however, dropped after Perera’s wicket in the 24th over. Once Atapattu’s vigil was brought to an end by spinner Hemalatha in the 42nd over, with the score at 193/3, it seemed India had the upper hand. 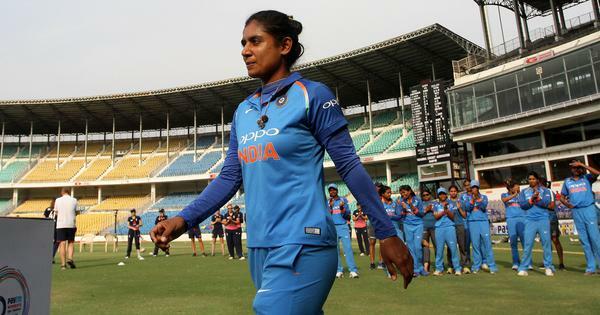 However, cameos from Nilakshi de Silva, Shashikala Siriwardene, Sripali Weerakkody and debutant Kavisha Dilhari ensured Sri Lanka got past the finish line with three wickets and one ball to spare. Earlier, India rode on captain Mithali Raj’s unbeaten 125 (143b, 14x4, 1x6) to finish at 253/5 – their highest total of this three-match series. This was also Mithali’s career-best knock in ODIs. After Jemimah Rodrigues was dismissed for a duck in the second ball of the match, Mithali and Smriti Mandhana put on a century stand. The duo batted with caution to ensure there were no more early wickets. As the partnership seemed to take the game away from the hosts, Chamari Atapattu got rid of Smriti, who made a 62-ball 51. A largely defensive Harmanpreet Kaur partnered her skipper for 12 overs before she was dismissed by Kavisha Dilhari for 14 (41b, 1x4). The hosts had to wait only seven deliveries to get their third wicket as Dayalan Hemalatha was bowled by Nilakshi de Silva for six. Deepti Sharma joined her skipper at the onset of the death overs. And the two batters upped the ante, attempting to score more boundaries. In the 43rd over, Mithali brought up her seventh ODI hundred. Mithali and Deepti put on a 92-run partnership before the latter was out stumped in the final over of the innings off Shashikala Siriwardene. Jhulan Goswami struck a six in the next ball to take India past the 250-mark. The five-match Twenty20 series between the two teams will begin on Wednesday at the same venue.